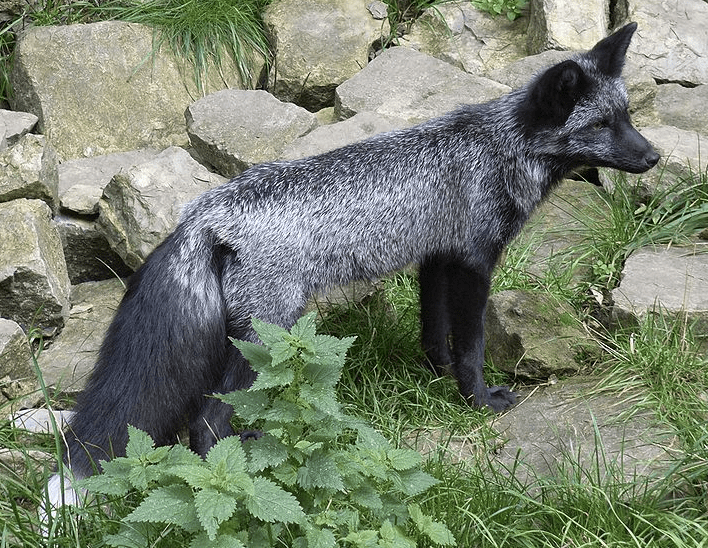 Silver Fox displaying “wild” phenotype – appearance. As promised last week in the post Are Bees Wild or Domestic I am going to discuss an experiment that suggests a link between behavioral genetics and development. 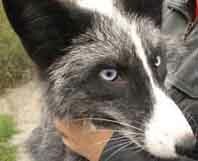 This experiment was done with foxes bred for tamability. In an attempt to discover how wild animals were transformed into the many domesticated forms known today. For years it had been debated. How did animals become domesticated? For instance did humans chose to domesticate wolves or did wolves chose to be domesticated by us culminating in the dog? Another stumbling block in the idea of domestication was that some believed that the road to domestication for say dogs, was based on size, and reproductive traits, others believed differently. Dmitry Belyaev was a Russian scientist who believe that domestication came from selective breeding based primarily on behavior; specifically, the behavior of being tame. He theorized that selecting animals for behavior may lead to other far reaching unintended changes in the animal’s development. Note the difference in appearance of this tame fox. 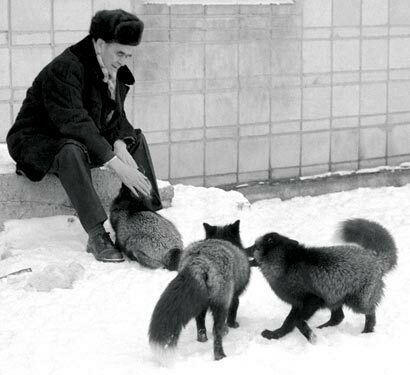 Sometime in 1959 Belyaev began his experiments with 30 male foxes and 100 vixens. He began to select foxes that showed the least fear of humans (and didn’t bite them). After about 10 generations definite changes had taken place. The population of foxes no longer showed fear of humans, began waging their tails and licking caretakers as a sign of affection. Physiological changes were becoming evident as well with spotted coats, floppy ears, and curled tails. Strangely all similar characteristics to those seen in dogs as well as other domesticated animals. Neurochemical changes appear to have taken place as well. There was an observed decrease in the production of adrenalin in this population of foxes. Adrenalin is a neurochemical that plays a key role in fight or flight response in animals. There was also a decrease in the basal levels of corticosteroid hormones. These hormones play a role in an animals response to stress. My dog better quit having accidents or he’s going to be replaced. Along with the physical and neurochemical changes there were also changes in the fox’s developmental and social behaviors. 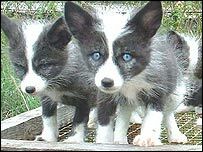 Domesticated fox pups began responding to auditory stimuli two days earlier, and opened their eyes earlier when compared to wild foxes. Domesticated pups show a fear response at 9 weeks as compared to 6 weeks in wild foxes. Dogs typically show a fear response at 8-12 weeks depending on the breed. Belyaev thus found that domestication could cause changes in post natal development of physiological and hormonal mechanisms that ultimately led to changes in social behavior. I don’t see floppy ears or a curled tail yet. If Belyaev’s model was properly executed it tends to indicate that selecting animals for behavioral traits alone can fundamentally change that organism. The next question is would bees, being insects, have similar outcomes if subjected to similar forms of selection? Undoubtedly the contrarian could attest that bees are not foxes, they aren’t even mammals and that is undeniable. Even if we can’t expect the same changes in bees through selection based on behavior, it seems foolhardy to assert that there will be no consequences from such selection. I have read about changes in honeybees in the last 100-150 years. For one, there are reports and articles that propolis production has been decreased. Also the physical size of the honeybee has been altered. What other things have changed? Is it possible that by selecting against protective behavior we could cause unforeseen problems? What if being more tolerant to human intrusions into the hive also would translate into a decrease in aggression towards other hive intruders such as wax moths, small hive beetles, and varroa mites? Given the hardships faced by bees currently would it be wise to allow the bees to do their own selection based upon on ability to withstand pests and/or overwinter as opposed to whether we get stung or not? Pose some answers in the comments and have a great weekend. Many of the pictures in this post are NOT my own. I am not attempting to seek financial gain from them or claim they are my own. This entry was posted in Posts, Rants and tagged bee, bee genetics, beekeeping, Indiana beekepeing. Bookmark the permalink. Very cool document, I have thought for some time now that “breeding” bees for low swarming, docility, ect ect is a bad idea, what if the trait for low swarming is a slow sick hive? Strange thing though is my bees are fairly docile (unless you open the hive) and they are about as feral as one could get, it seems to me that docility is also a factor of colony size, nucs are always quite were as the bigger hives tend to get aggressive during inspections. From my reading of Bee Culture and American Bee Journal I have not read about anyone asking these questions. I think that there needs to be some way of objectively evaluating docility. It is a subjective thing. One person might say their bees are mean, if they are jerking and banging things around on hive inspections and getting stung. Since I began video taping myself doing hive manipulations, I notice those things more. My hives I feel are docile, but they will not tolerate having their hive opened and being banged around. I don’t think they are mean, or aggressive, but someone else may subjectively call them that. I feel as though every time I have ever been stung, it has been my fault. I either squished a bee, dropped or banged something, opened up a feral hive to the elements – using a hammer, pry-bar, and saw. I have also noticed that larger colonies seem to have “less patience”. All of the production colonies are three deeps now, and some are four. Those really big colonies begin to make the “we are all getting irritated with you opening our house” – TONE a lot quicker on hive inspections. Do you know this, sound? When the open hive goes to a louder, higher pitched buzz. Let me know if you have experienced it. Perhaps I am just crazy. Selective breeding for anything is a tricky business. Look at dog breeds today. Instead of being bread to perform a certain task, they are more commonly being bread for a certain “look”. Then you read about all of these weird conditions that these pure-bred dogs are afflicted with: screwed up teeth, weird allergies, eyeballs all bugged out. I am going to keep doing what I’m doing as long as it keeps working. I think bees and beekeepers can find solutions to these problems, if they just allow themselves to experiment, observe, and be patient. Thanks for reading and commenting Sam. I have also been thinking about this same issue. I have two sets of bee one are very calm and quit these bees were caught as swarms from my grandpa. I have another set of bees I am houseing for my mom that are very aggresive and use a lot of propolis thier is a major difference between the two. My grandpas 14 hives only produced two full supers of honey this past year while my mom’s hives produced 12 supers off of 6 hives. You do the math. I have 15 hives that I started from swarms this year I did not take any honey from them so I am courios to see what next year will bring for me. Your observations are right in line with what I am seeing. One thing about your grandpa’s this year was the large number or swarmes that they produced. That definatly cut into his honey production. I got 19 supers off of 10 hives, and left 10-12 supers on because I didn’t have enough honey storage for them. I will be extracting that in the spring. Not only honey and propolis prodcution, but overwintering ability seems to be better when the bees are a little more aggresive. Continue to make observations and let me know how things are going.